I am so so anxious, I only have 1 week until #BoiseWhatAGirlWants Expo. It’s been 3 years since my last vendor fair. I am taking a step back to make sure all of my “i” are dotted and “t” are crossed. My card reader, business cards, and bags are in. I need to make my table runner/banner and some more hangers. My BF was my handsome handyman and made me a peg wall. I also need to take my phone in and replace the screen so that no one cuts their finger while signing! So much to think about. On Pinterest, I made a board for Business Tips. On this board you will find good ideas for table runners, booth set up, display examples, etc. 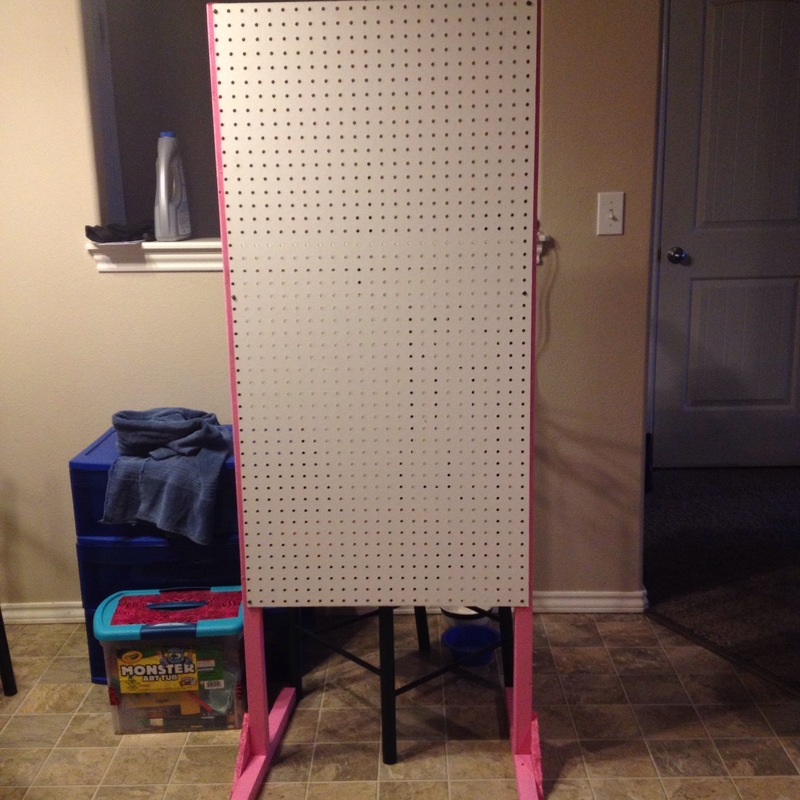 This is where I got the idea to make a peg board. We went to the local lumber store and picked up a big sheet of peg board and gathered some 2x2s and scrap wood. Some cutting here, some screws there, a little paint and BAM, peg board display! Yesterday, I made a test run of some doll clothes hangers. I found this tutorial to be quite helpful. Some tips: if the threads are too thick to just slide in between your craft sticks, grind them down on each side, super glue works great but be careful, and try to pick out sticks that are fairly straight so that they will glue together better. 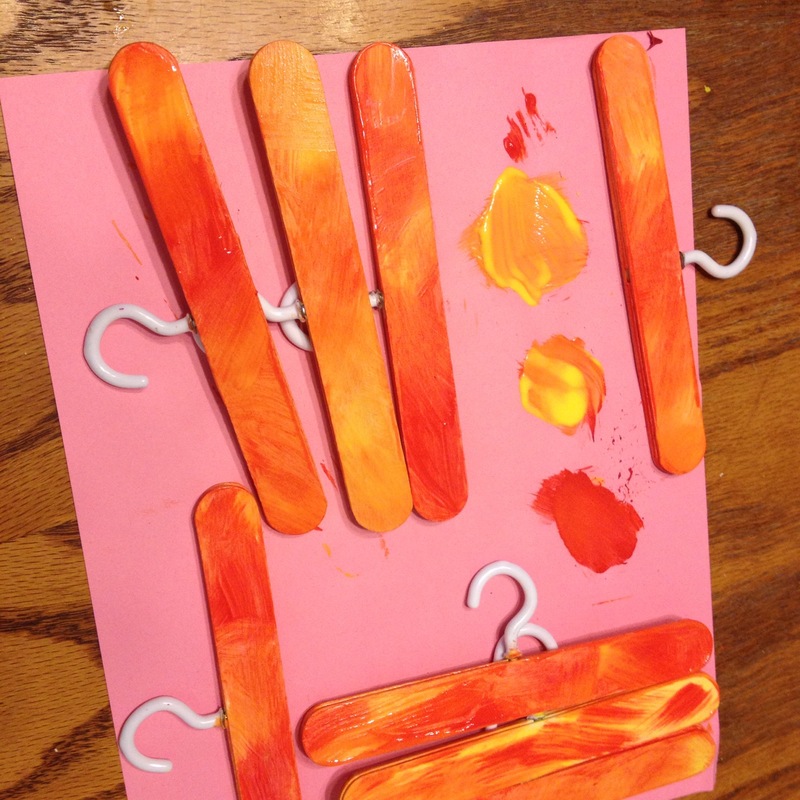 I painted mine with yellow and red craft paint and plan to write Phoenix Fabric Art on them. We could only find 4 packs at our local Walmart so I will try our local hardware store for bigger packs and make more since this was a success. If you are in the Boise area on May 30th you should come see me and mom. Also bring your kiddo and her doll for a free pair of doll undies. Check out #boisewhatagirlwants on Twitter and Facebook for more vendor posts! We hope to see you there!